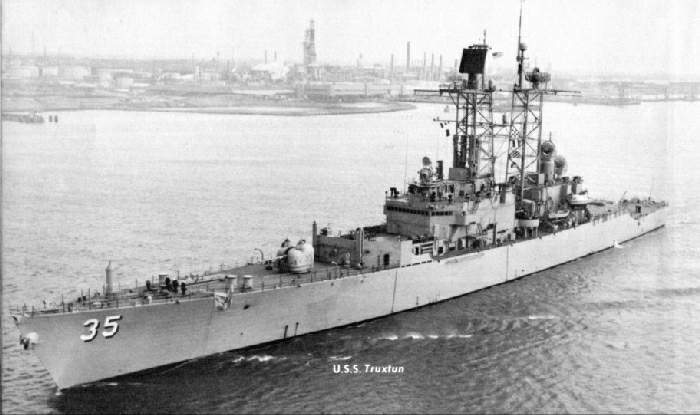 The USS TRUXTUN was the third nuclear powered guided missile cruiser in the US Navy. 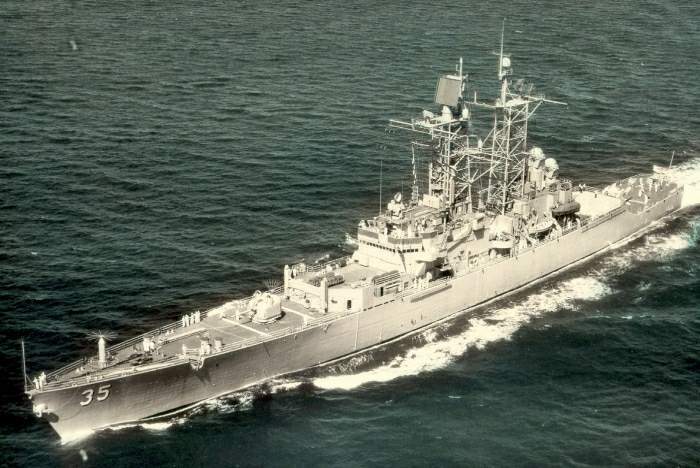 Originally, the ship was scheduled to become a BELKNAP - class cruiser but the United States Congress decided that the ship should become a nuclear powered cruiser and so the TRUXTUN was completed as a (very) modified BELKNAP-class cruiser. The nuclear propulsion system resulted in increased dimensions. That is also the reason why the TRUXTUN displaced about 1.300 tons more than the BELKNAPs. Another obvious difference are TRUXTUN's two large masts instead of the macks aboard the BELKNAPs. The armament and electronic systems of both classes were the same although the locations were different. Aboard the BELKNAPs, the Mk 42 gun was located on the quarterdeck while aboard the TRUXTUN that gun was located on the foredeck. The Mk 10 Terrier missile launcher also had opposite positions. Aboard the TRUXTUN the Mk 10 launcher was situated on the quarterdeck. 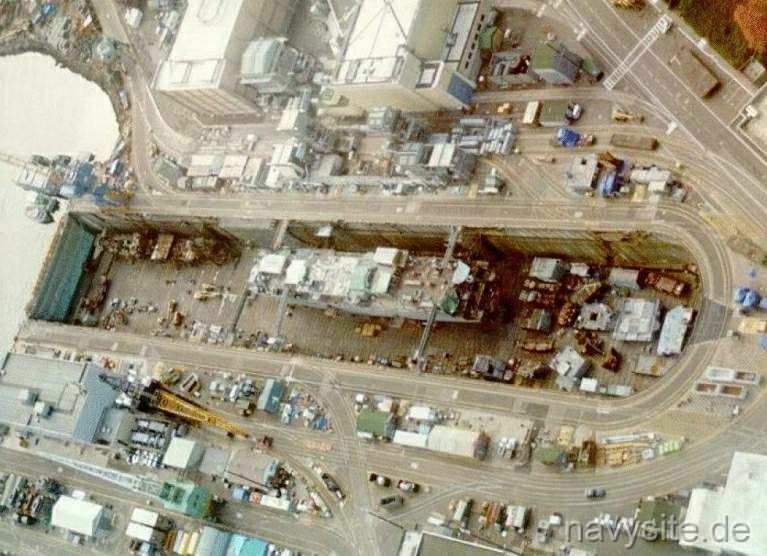 Its depot for the missiles was located below the helicopter flight deck and was able store 40 Standard SM-1 ER and 20 ASROC missiles. There is an interesting aspect relating the missile launchers: TRUXTUN was developed after the LEAHY- and BAINBRIDGE-class. Both classes were equipped with two Mk 10 launchers but the TRUXTUN as well as the BELKNAP-class which were built later only got one Mk 10 launcher and that means that they only had one depot for the missiles but these depots were 30% larger than the ones aboard the BAINBRIDGE and LEAHY-class cruisers. This shows that the SAM capacity did not always increase with newer classes. In this case it even decreased. In the beginning the TRUXTUN was equipped with two Mk 25 torpedo tubes for wire-guided torpedoes. These tubes were located in the stern. Later, they were removed and just the small opening in the stern remained. TRUXTUN was also equipped with four Mk 32 torpedo tubes which were located in the after part of the superstructures. These tubes remained aboard. TRUXTUN was commissioned with two 76mm (3-inch)/50 caliber twin guns. These guns were used for AAW and were removed in 1980. TRUXTUN got two Mk 141 launchers for Harpoon Anti-Ship missiles instead. From February 1974 to June 1975 TRUXTUN underwent her first comprehensive overhaul and nuclear refueling at Puget Sound Naval Shipyard, Bremerton, Washington. Upon completion of the overhaul USS TRUXTUN was redesignated as a Nuclear Guided Missile Cruiser (CGN). Before she had been designated as DLGN. From September 1982 to July 1984 USS TRUXTUN underwent her final complex overhaul at Puget Sound Naval Shipyard which included the installations of two 20mm Phalanx CIWS and two SLQ-32 systems. In the beginning TRUXTUN's hangar was only designed to accommodate the DASH system. In 1971 the hangar was converted to be able to accommodate one SH-2 helicopters (LAMPS I). Later, it was also planned to upgrade the hangar to support LAMPS III operations but the project was cancelled. Back to Guided Missile Cruiser list. Back to Ship list. Back to selection page. Back to 1st page.